Shop online for over 300 n-scale-arch model trains at discounts up to 34%. Buildings is the most popular of the 9 n-scale-arch model trains categories, then Roadway, and Railroad Scenery. This is the Z Scale Etched Brass Fencing Kit Model Builder's Supply Line (750 Scale Feet) from The N Scale Architect. 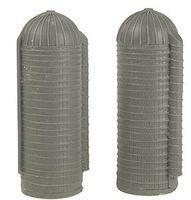 This is the Nansen Street Models - Division of N Scale Architect - Farm Silos (Pack of 2). This is the M-Trak(TM) Equipment (Unpainted Metal Castings) - 4-Ton Mine Cars pkg(3) by The N Scale Architect. This is the N Scale 3-Rail Corral Fence with gates Model Builder's Supply Line (560 Scale Feet) from The N Scale Architect. 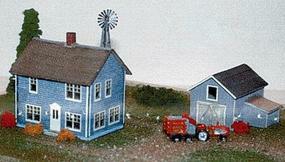 This is the Nansen Street Models - Division of N Scale Architect - Farm House, Carriage Shed & Windmill Box Set. 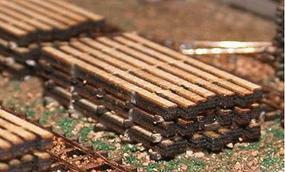 This is the Timber Stack (8x8 w/Separator Webs) pkg(4) by The N Scale Architect. This is the Stacked Hay Bales (4-Stacks of 12 Rectangular Bales) by The N Scale Architect. This is the Z Scale Spear-Point Fence Kit (Etched Brass) (750 Scale Feet) from The N Scale Architect. This is the Z Scale Shire Scenes Dumpsters (Rubbish/Garbage Bins) Kit (Etched Metal) pkg(2) from The N Scale Architect. This is the Quality Meat Stockyard Master Craftsman Series Kit (10 x 5'' 25 x 12.5cm) by The N Scale Architect. This is the Waterville Switchman's Shanty Kit (1 x 3/4 x 1'') by The N Scale Architect. This is the N Scale Etched Amish Buggy from The N Scale Architect. This is the N Scale 3-Rail Corral Fence w/Gates - Model Builder's Supply Line - Etched Brass Fencing (300 Scale feet) from The N Scale Architect. This is the Small Relay Cabinet/Signal Box - Making A Scene(TM) - pkg(6) by The N Scale Architect. This is the 1929 Chevrolet Coal Delivery Truck Kit With Figure by The N Scale Architect. This is the Z Scale Diesel Tug Boat - Kit (Resin) (4-1/2 x 3/4 x 1/4'' 11.4 x 1.9 x 3.2cm) by The N Scale Architect. This is the HO Scale Styrene Sheet (.020 x 11 x 14'') American Bond Brick (6th Row On-End) pkg(2) Model Builder's Supply Line from The N Scale Architect.